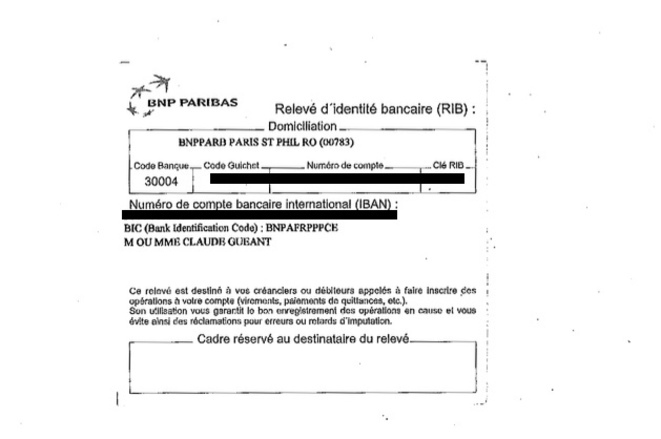 Bank details of former French Minister of the Interior, Claude Guéant, annexed to the contract between Gueant’s company and the City Hall of Nizhjni Tagil, Russia, for consulting in the interest of the French company, Veolia. The mayor of Nizhjni Tagil, Sergey Nosov, is advisor to Sergey Chemezov who, in its turn, is believed to have negotiated the selling of Mistral helicopter carriers by the French government to Russia. Contract found in the context of the investigation into the case of Nicolas Sarkozy’s alleged illegal campaign payment from Libya and is suspected to be a cover for alleged illicit kickback payments. Fragment of the contract between the company of former French Minister of the Interior, Claude Gueant, with the city hall of Nizhjni Tagil, Russia, for consulting in the interest of the French company, Veolia. The mayor of Nizhjni Tagil, Sergey Nosov, is advisor to Sergey Chemezov who, in turn, is believed to have negotiated the sale of Mistral helicopter carriers by the French government to Russia. The contract was found in the context of the investigation into the case of Nicolas Sarkozy’s alleged illegal campaign payment from Libya and is suspected to be a cover for alleged illicit kickback payments.